NBA Power Ratings And Playoff Odds: Playoff Power! Tim Duncan of the San Antonio Spurs during a game against the Golden State Warriors on April 5 in San Antonio. The NBA regular season ends Wednesday, and the playoffs begin Saturday. 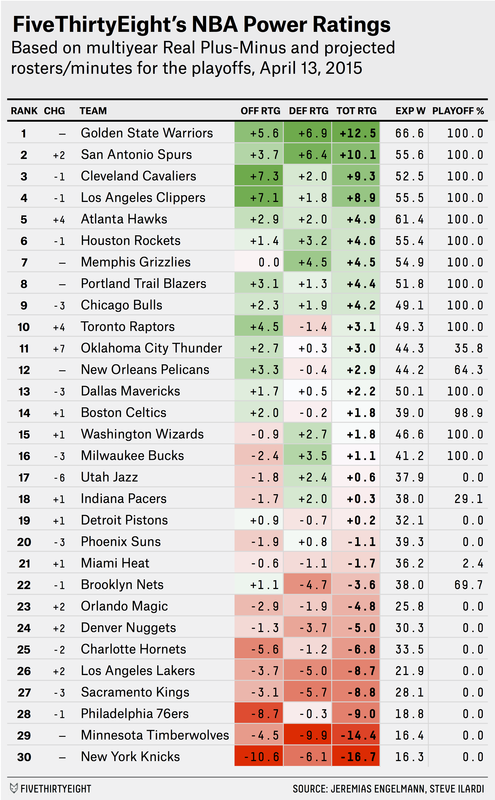 And with that in mind, we’re going to shake things up a bit with regard to FiveThirtyEight’s NBA Power Ratings. But this week, with many teams resting key players in preparation for the playoffs, we’re ranking every team according to its projected playoff power rating. This means we’re projecting every team to be at “full strength” in terms of minutes given to players who will be available for the postseason, instead of only projecting for the next week. Playoff probabilities and expected end-of-season wins are still driven by projected minute distributions over the next few days, but the power ratings themselves have been geared to capture the talent that each team is bringing into the playoffs. With the playoffs being emphasized more in our ratings, it’s fitting that the San Antonio Spurs rank in the top two for the first time since early February. They’ve won 11 straight games, a run backed up by the underlying talent of one of the league’s best teams. The Atlanta Hawks also benefit from our switch to “playoff power” — while Thabo Sefolosha’s bizarre season-ending injury hurts their chances of winning the championship, we’ve boosted the playing time for many of their good players who have consistently been listed as day-to-day in the injury report in recent weeks. As for teams on the fringe of the playoffs, we noted last week that the Boston Celtics were basically a coin flip to make the playoffs, battling it out with the Brooklyn Nets, Miami Heat and Indiana Pacers for one of the two remaining postseason slots in the Eastern Conference. A week later, the Celtics have all but completely claimed their spot; our model now gives them a 98.9 percent probability of making the playoffs. By the same token, the Heat have almost completely dropped out of the race, with just a 2.4 percent chance of qualifying for the postseason. That leaves the Nets and Pacers to fight over one spot with two games left per team. Our calculations give Brooklyn the inside track largely because of the team’s possession of the tiebreaker over Indiana, in addition to an easier remaining schedule (the Nets face the No. 9 Chicago Bulls and No. 23 Orlando Magic; Indiana faces No. 7 Memphis and No. 15 Washington). Out West, the race for the No. 8 seed is between the New Orleans Pelicans and Oklahoma City Thunder, and the Pelicans have the edge in our simulations. Oklahoma City is marginally more talented, according to RPM, and is even projected to win fractionally more games on average, but New Orleans holds the tiebreaker over the Thunder. In no small part because of those tiebreakers, there’s a 45 percent probability that the Nets and Pelicans will be the final two teams to slip into the playoffs when the season ends Wednesday.